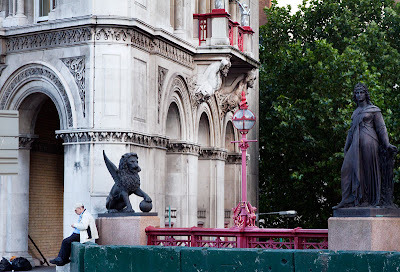 Opened in 1869, the Holborn Viaduct enabled access between Holborn and the City of London across the Fleet Valley avoiding the steep hills. Now crossing a major road (the A40) it is in fact a subterranean river. The Fleet was a major river in Roman times. In Anglo-Saxon times the wells along its banks were reputed to have healing qualities. However as London grew it became more of an open sewer until eventually covered over. There are still one or two spots where the river can be heard flowing beneath the streets. There is some talk of opening short sections of it for ornamental purposes. Courtesy of host Louis La Vache visit a few more Sunday Bridges. How elegant! I, for one, would quite like to see sections of the subterranean Fleet river opened for viewing. How interesting! I had no idea the Fleet even existed! I'd love to see some of it opened up. Water adds so much to any cityscape. I enlarged the photo, it contains so many interesting details. I must say WOW! And the man, just sitting there and makes the picture complete. interesting information about this bridge. i like the classic elements in this photo. We all learn so much history just by visiting city daily photo sites! All school students should pick a city and follow the photos. This would be a fun and informative one! I find it amazing that there are spots where you can still hear the river flowing! Great story and a lovely bridge! We have a river that in Montreal as well,the Petite Rivière St-Pierre. It's down to a trickle now though and it can be seen at the Pointe-À-Callière Museum in Old Montreal. hee hee... The reputed healing qualities of the water were replaced by the opposite effect by the use of the river as an open sewer! That comment reminds «Louis» of how the streets of Paris must have been pre-Haussmann. «Louis» thanks you for your contributions to the Sunday Bridges series. I recognized Holborn Viaduct right away. I spent more than my usual 20 seconds trying to photograph the griffins on the crests attached to the bridge. I just arrive by chance on this blog and find it very interesting. I'll come back!